The long-awaited cooperation on the Caspian Sea in the energy sector, which became the main topic for discussion between Azerbaijan and Iran, takes on a clearer outline as the Caspian states are expected to adopt the convention on the legal status of the sea this year. The legal status of the Caspian Sea has remained unsolved during more than two decades, preventing development and exploitation of its disputable oil and gas fields and creating obstacles to the realization of major projects. For a long time, the principle of delimitation of the sea’s water area was the apple of discord among the littoral states. The Caspian states were mulling two possible options to determine the legal status of the Caspian Sea: delimitation using a mid-line modified method or division into 5 equal parts given each nation a 20 percent share. If the Caspian is legally declared a sea, all five littoral countries would map out their territorial waters and exploit the resources as they see fit. The recent visit of Iranian President Hassan Rouhani to Azerbaijan truly marked the beginning of a new era of cooperation between the Caspian states. The decisions achieved at this meeting may be called without exaggeration ‘strategic and historic’. The meeting of President Ilham Aliyev and his Iranian counterpart largely focused on the opportunities for cooperation on the Caspian Sea. The sides must make the maximum use from the waterbody through cooperation in the fields of science, economy, trade, maritime, fishing and tourism, President Rouhani believes. Although many different aspects of cooperation on the Caspian Sea were mentioned, the biggest achievement of the talks, which consequently may accelerate the adoption of convention on the legal status of the Caspian Sea, can be considered the signing of a MoU on the joint development of blocks in the Caspian Sea between the Azerbaijani Energy Ministry and the Iranian Oil Ministry. The document, signed by Azerbaijan's Energy Minister Parviz Shahbazov and Iranian Oil Minister Bijan Namdar Zanganeh, should be viewed as a turning point in ties between the two littoral states since it would allow to jointly make use of resources of the Caspian Sea. Baku and Tehran used to have serious disagreements regarding the delimitation of the Caspian Sea and joint energy cooperation. The oil blocks which fall under newly-signed agreement might include the Araz-Alov-Sharg field, which was allegedly located at the same area with Iran's Alborz oil block. The cooperation on the oil block has long been the main sticking point between the sides, as both Iran and Azerbaijan have differences over its ownership. The development of the Araz-Alov-Sharg block is frozen until the Caspian Sea status is agreed upon between Azerbaijan and Iran. Therefore, the sides will strive to resolve all the issues hindering the early adoption of convention on the legal status. In addition, this move demonstrates the will of two nations to forget old disagreements and look into future hand in hand. Within the framework of his regional tour, Rouhani earlier visited Turkmenistan where he also met with Turkmen president Gurbanguly Berdimuhamedov. Both states support strengthening of positive interaction in the Caspian Sea, strengthening its status as a sea of peace, friendship and harmony. Both countries are active participants in the negotiation process to determine the legal status of the Caspian Sea. On the initiatives put forward by the Turkmen and Iranian sides, a solid legal framework that regulates the activities of the five coastal states in the Caspian in various fields was established. Transportation is the key sphere of cooperation between Iran and Turkmenistan on the Caspian Sea. At present, the work on the implementation of the large construction project of the Turkmenbashi International Sea Port is being completed in Turkmenistan. This will allow increasing the communication by sea with the Iranian ports of Enzeli and Nek in the future and through the port of Bandar-Abbas in the Persian Gulf. During the meeting with his Turkmen counterpart, Rouhani highlighted the great prospects for partnership in the region in the oil and gas industry, which meets the interests of economic development of both countries. Coastal states actively cooperate, and this work will be continued, especially in the field of ecology, biosphere and other directions. Rouhani stated the presence of big opportunities for the development of Turkmen – Iranian trade and economic partnership, which are necessary to be realized with maximum output. 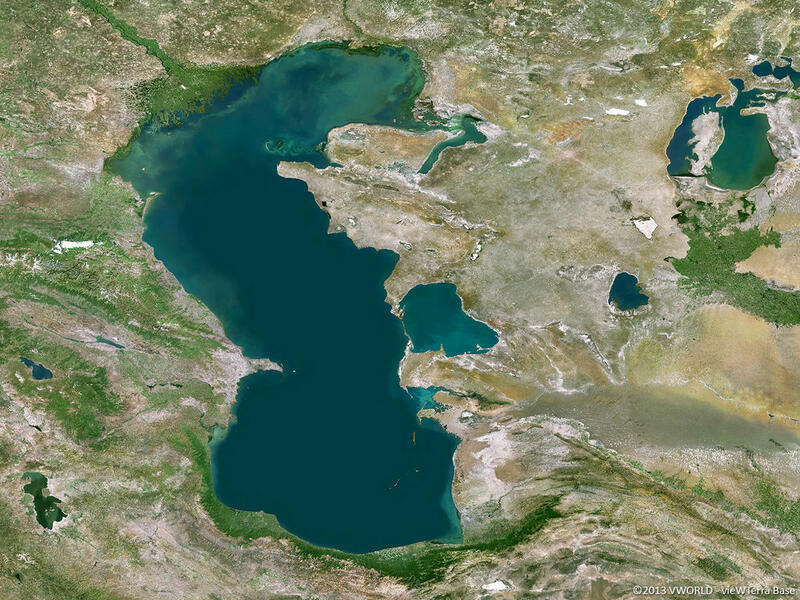 Caspian Sea, the largest enclosed inland body of water on Earth, is surrounded by the five coastal countries of Azerbaijan, Iran, Kazakhstan, Russia and Turkmenistan. The issue of determining the legal status of the Caspian Sea became relevant after the collapse of the USSR, when the emergence of new subjects of international law - Azerbaijan, Kazakhstan and Turkmenistan - raised the issue of delimitation of the Caspian Sea between the five littoral countries. The difficulties in determining the status of the Caspian Sea were linked, in particular, with the recognition of it as a lake or sea, the delineation of which is regulated by different provisions of international law.